Shipworms: Why Are They So Destructive To Your Dock’s Pilings? Protecting your dock from erosion and bad weather is essential. But did you know there could be another, more destructive problem attacking your dock’s pilings right now? Wood boring worms called shipworms are water-dwelling animals that eat the wood of dock pilings. You can’t get rid of shipworms with pesticides or by simply removing them. However, as a marine contractor, DOCK and DECKS, can kill the wood boring worms for you by repairing and securing your dock’s pilings with piling wrap. Here are things you need to know about shipworms, and why it’s critical you Dock and Decks to take care of the problem for you. Wood boring worms or shipworms aren’t true insects. In fact, they come from the mollusk family and live in the salt water surrounding your dock. Although shipworms eat wood as a food source, the pests can’t survive without water. Like many other marine life, the worms use gills to breathe oxygen through water. Most marine contractors refer to these pests as sea termites because of their destructive nature. Once shipworms find your dock’s pilings, they burrow through the wood until there’s nothing left. This can be very dangerous for anyone standing on the dock — especially if it collapses into the water. You can look for signs that you have a shipworm problem in your dock’s pilings. This is the first step to protecting your dock. How Do You Know If You Have Shipworms on the Pilings? To make sure you have shipworms in your pilings, our dive team will physically enter the water to find them. The worms are not easily seen from a distance due to their small sizes. 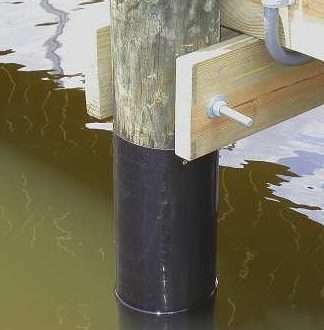 Once we enter the water, we look for round holes along the bottom half of your pilings. The holes will be located near or below the water’s surface. We also test the thickness of each piling as some pilings are eaten from the inside out. If you have a large infestation in your pilings, we will see large groups of shipworms attached to the pilings. Although you can’t see them, the holes in the pilings contain the larvae of shipworms. Even if you brush off the adults, the larvae still endangers the structural safety of your dock and pilings. As a marine contractor, Dock and Decks, helps to stabilize and secure your pilings from the adult wood boring worms and their young. The first step requires us to wrap the pilings with a black “shrink-wrap” type material to suffocate the shipworms. Then we wrap your pilings with a high density polyethylene using 316 stainless steel fasteners. As a result, the adult shipworms and their larvae die from the lack of oxygenated water and the wrap protects from reinfestation. But if the pilings sustained a lot of damage, we can install new pilings to replace them. We can also install a SnapJacket around the piling and fill with concrete. Concrete is a construction material that keeps the dock upright during storms, low tide, or some other critical issue. If you have questions about shipworm damage, have a loose piling, or just want peace of mind regarding your pilings, contact Dock and Decks, your marine contractor, for more details. Share the post "Shipworms: Why Are They So Destructive To Your Dock’s Pilings?"